Analysis According to industry watchers, below the surface of Microsoft's Surface business it's not a happy picture. Microsoft claimed to turn its first profit on Surface in 2014, after racking up $2bn of losses, and by 2016, it was almost out of the woods. Amid a collapsing tablet market, and just in time, Microsoft had redefined Surface as a fancy PC. It was Bruce Willis walking away from an exploding building, chewing gum, not looking back. Phew! More expensive boutique products followed from the House of Shiny Hardware. A detachable Surface Book. A cloth-covered MacBook Air clone, the Surface Laptop. A Surface Studio touch PC, which tops out at over £4,000 – but you do get a wireless mouse. Even a wall-sized Surface Hub, updated this week. Most could be described as "lavishly over-engineered and ludicrously expensive" (as we did here ) – but El Reg praised Microsoft's attempts to raise quality and expectations for PCs. You can expect a rough ride when you try and create a product category, but you can only do so with crazy experiments – and many experiments fail. Surface has helped polish Microsoft's brand, as a stylish and useful tool for creatives and entrepreneurs, for architects, engineers, and designers. It was Microsoft's revenge on Apple's "I'm a Mac, you're a dweeb with dandruff, Bill Gates" ads, which apparently irritated Bill enormously. However, last year, the CEO of Canalys predicted that the boutique hardware party would come to end – perhaps in 2019, said Steve Brazier, maybe even sooner. Brazier explained that Microsoft had made its point, and it no longer needed to pour money into hardware when those resources could be spent on software and the cloud. Overheating hardware boss Panos Panay reacted gracelessly – calling it "tabloid rumour of the week" – and yes, I think he meant us. But we were merely reporting the impartial view of analysts who thought the experiment was more precarious – and certainly volatile – than the PR suggested. No one can argue with today's Surface revenue, but if the profits story is as sketchy as Brazier hints, then a new report this week that Microsoft will venture back into low-cost tablets may make investors even more nervous. Low-cost tablets is how Surface started – at $499 for the cheapest RT Surface. According to Bloomberg's Apple scoopmeister Mark Gurman, and Dina Bass, the new Surfaces will start even cheaper: "About $400... be about 20 percent lighter than the high-end models, but will have around four hours fewer of battery life." But it's the price that is ominous here. Microsoft last attempted a "budget Surface" with the Atom-powered Surface 3 in May 2015, which, despite its creaking performance, was a very likeable machine. The base model came in at £429 and Currys flogged it with a keyboard included for £529 (128GB). Unlike its more expensive Pro sibling, the regular Surface supported LTE. It was a promising start. But it threatened to cannibalise the Pro range, putting the great hardware experiment in peril. A return to cheap tablets carries the same threat: can Microsoft sufficiently differentiate a "cheap" Surface from a Surface Pro, and sacrifice the margins the hardware business needs? As I found here, the iPad is becoming much more credible as a professional alternative. 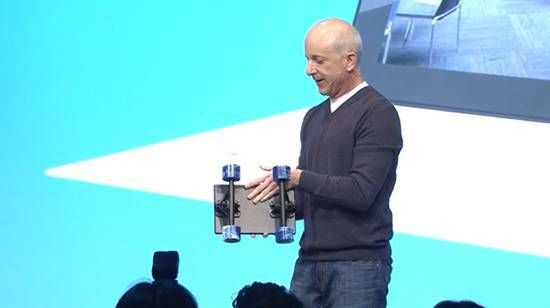 Microsoft doesn't have to abandon hardware. It is developing the know-how for new category-defining products like this flexible, book-like tablet. Going up against Apple with something that's really a poor touch PC doesn't make sense.